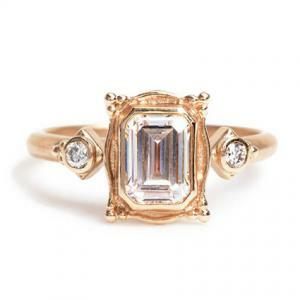 Many of the top jewelry designers are re-discovering the beauty of rose-colored gold. Its pink hue complements most skin tones and offers something different from the standard gold used in engagement rings. Whether you're looking for a vintage ring or something a little more modern, you'll find a style made from rose gold to suit your tastes and your budget. Rose gold has been used in jewelry since the 1880s during the late Victorian Era. In the 1920s, Cartier introduced their Trinity ring, which featured three bands of interlocking yellow, white, and rose gold. This sparked a renewed public interest in the metal. Current jewelers are re-acquainting themselves with rose gold and brides are wearing engagement rings featuring the pink-toned metal that blend antique vibes with today's fashionable trends. Pure gold is too soft to be effectively made into jewelry, and all engagement rings and other gold pieces are alloys. The typical metals blended with pure gold to add strength and durability are palladium, nickel, silver and copper. The proportions of those metals lead to the exact shade of the gold and rose gold engagement rings have a greater amount of copper in the metal alloy. Because copper's natural color is a rich burnished red, diluting it with the gold and silver in the alloy results in a pink tinge. The typical blend of gold to copper that gives the final metal a pink hue is three parts gold to one part copper. The precise proportions vary, however, and some manufacturers prefer to add trace amounts of silver or other metals to further adjust the tint. The higher the percentage of copper the darker the red coloration and rose gold can actually be found in many hues. One consideration when shopping for rose gold is that if an individual is allergic to copper, her finger may swell or discolor because of the copper in the alloy. Rose gold is priced the same as other colors of gold that are of the same karat. However, since some rose gold rings need to be special-ordered, they may be priced higher than their counterparts. A few designers already have stock pieces available in rose gold while others can readily manufacture some styles in the pink metal, with only a slight delay in delivery. Despite it being a bit more obscure than its yellow and white cousins, rose gold is used in a number of different engagement ring designs. The stunning beauty of the alloy is a delicate contrast to traditional metals, making it particularly popular for brides looking for a subtle richness rather than the flashy bling that is so commonly seen. Robbins Brothers carries numerous designers that offer rose gold engagement rings. With retail outlets across the country, their store in Fullerton, CA alone garnered over 130 reviews on Yelp.com for a 4.5 star rating, with reviewers highlighting the excellent customer service. They have a 30 day return policy both online and in store. Designer Kirk Kara has many options available for rose gold engagement rings and rings shown in a white metal can be special ordered as rose gold. This 18k rose and white gold ring features diamonds accenting the shank of the ring. The diamonds total .20 carats and the ring retails for around $3,300, with an available matching wedding band. The center diamond is ordered separately and not included in the price of the band. 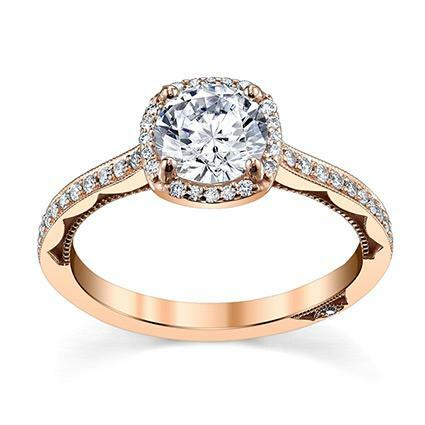 This 18k white and rose gold halo diamond engagement ring by Danhov is in the popular halo style. It has double rose gold bands as a background for the diamond-accented white gold shanks that encircle the finger. The diamonds total .50 carats. The ring retails around $4,400 and the center diamond is not included. Designer Sun and Roses works with rose, white, and yellow gold. This 14k rose gold diamond engagement ring has pave set diamonds through the shank for a total of .25 carats. It retails around $1,100 and has a matching wedding band. The center diamond is not included. Greenwich Jewelers is a second generation jewelry store currently owned by the daughters of the original owner. Reviewers at YellowPages.com and Wedding Bee give the store high praise for customer service and value for their money. They offer free ground shipping on orders over $150 and have a 30 day return policy. Greenwich Jewelers is located in New York City but you can shop online from anywhere in the United States. Designer Megan Thorne uses antique-inspired motifs in her styles and uses rose gold extensively. This picture frame ring is fabricated from rose gold with round diamonds on each side that total .06 carats. 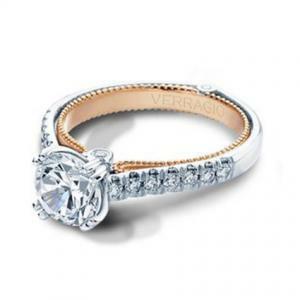 The 18k rose gold ring retails around $1,600 and is available in other colors of gold and platinum by special order. The center diamond is not included. This modern bypass micropave diamond band engagement ring by Ritani features .19 carats of diamonds which are micro pave set through the shank. The 18k rose gold ring retails around $1,500 and the center diamond is not included. Arthur's Jewelers has received many honors and accolades including Most Outstanding Bridal Jewelry by Minneapolis/St. Paul Magazine in 2012. They offer free, three day shipping on all orders over $200 and have a 30 day return policy. They are located in Roseville, MN, but you can also shop online. This Tacori vintage 18k rose gold ring features diamonds aligning the shank amidst intricate scroll work. The diamonds total .25 carats and the ring retails around $3,200, without the center diamond which must be purchased separately. This Verragio vintage rose gold ring features round diamonds aligning the shank while bezel set round diamonds accent the milgrained scroll work on the profile of the ring. The diamonds weigh a total of .30 carats. This 14k white and rose gold ring retails around $3,000, which does not include the center diamond. Designer Simon G uses rose gold to fabricate engagement rings as well as using it as an adornment. This Simon G side stone 18k rose ring features graduating sizes of round diamonds accenting the tapering shank. The diamonds total 1.01 carats. The ring retails around $5,000, which does not include the center diamonds. The Three Graces has an extensive collection of antique and period jewelry, many including designs done in rose gold. Owner Lisa Stockhammer-Mial is a world-renowned authority on antique jewelry. She is a member of The American Society of Jewelry Historians and is a frequent lecturer at the Antique Period Jewelry and Gemstone Conference. The shop offers free shipping and free return shipping. Alert them within three days of receiving the item if you are not happy with it for a full refund once the item has been returned. Lang Antiques has an entire Antique Jewelry University online to educate all shoppers on the intriguing world of antique jewelry. They have a free-standing store in San Francisco for in-person shopping as well. They offer free shipping on items over $2,500 and a 10 day return policy. While yellow and white shades of gold are consistently popular, rose gold engagement rings have recently been favored by brides-to-be who desire a more unique ring. The addition of copper in the ring's alloy gives it a stunning pink hue that perfectly matches the romantic symbolism of the ring and highlights the distinction and elegance of the woman wearing it.